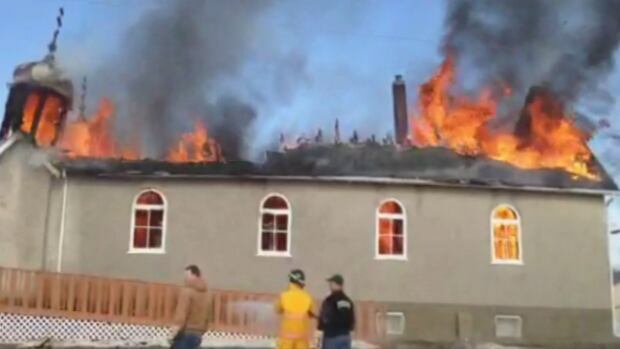 The small town of Thorhild, north of Edmonton, is reeling following the devastating loss of one of their landmark churches. Precious religious icons, wooden pews and thousands of memories vanished when the church burned to the ground on Saturday. Ron Feledichuk, the past president of the Ukrainian Orthodox Church of St. Peter and St. Paul said it's akin to losing a a close family member. “That’s the kind of feeling you get in your stomach,” he said. Feledichuk said even as firefighters were hosing down the smoldering building, stories were being told about when “Baba and Gido were members of the church,” and how they were all baptized in the church in the 1960’s. The 69-year-old brick landmark structure went up in flames on Saturday Feb.28 around noon according to Thorhild County fire chief Nick Kuzyk. As many as five members of the congregation were at the church cleaning for Sunday’s service, according to Kuzyk, when somebody smelled smoke. By the time the fire truck arrived ten minutes later “the church was already burning," said Kuzyk. It’s a devastating blow to the community of about 500 people, about 85 km north of Edmonton. Aside from the building Feledichuk said "irreplaceable" religious icons were also lost. But Feledichuk is optimistic about the future. On Thursday, Feledichuk said church members will gather to decide where to worship. Already, Feledichuk said other churches have offered to help. The cause of the fire has not been determined but problems with the building's electrical wiring are suspected.